Online issuance of Central Statutory Forms for the Years PRIOR to Financial Year 2012-13. Procedure for issuance of central statutory declaration forms (C, F, H, E-1 and E-2) for the year prior to 2012-13 i.e. FY 2011-12 and the period before that. Filing up the details such as name, amount, TIN etc. of the selling parties to whom forms are to be issued. Filing of requisition with complete details. 1. Login to Dealer login on DVAT website. 2. From the Menu select "Online Forms"
Go to "Data Entry for form upto 2011-12"
4. Now select the "Financial Year" and "Period"
Now by selecting selling party TIN a list of saved data will appear below save button in a green colored table. 6. After we have filled up all the details and pressed the save button entire information filled will appear in the green colored table. i) From the menu go to "Online Form"
iii) Select select the "Financial Year" and relevant "Period"
B. Now a "Requisition Account" appears which shall be as per the details filled by us earlier in the previous step. Bill wise, against each form. · The requisition for forms shall now be sent to the VATO's login, automatically. i) These purchases are recorded in the return. 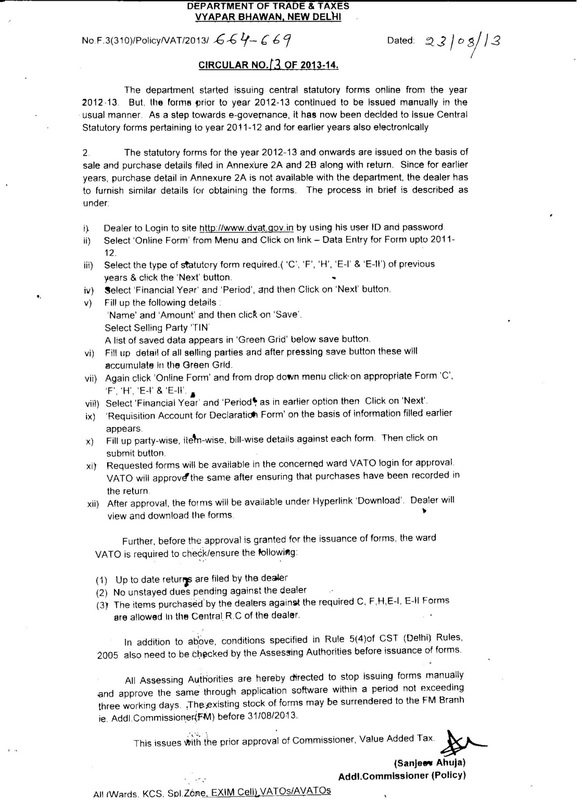 ii) Upto date returns are filed by the dealer. iii) No amount unstayed is due against the dealer. iv) Items of purchase are mentioned on the RC of the dealer. v) Conditions specified in Rule 5(4) of CST (Delhi) Rules are fulfilled. Once the requisition is approved, the forms shall be available for download under the menu option "DOWNLOADS"